The newly formed City of the Falls Company purchased 400 acres of land from William Forsyth. They began laying out their city in streets and lots. The Company had subdivided the new city into approximately 300 – 400 lots worth $400 per lot. Each average lot boasted a frontage of up to 35 feet by 140 feet deep. Lots bordering the river had frontages averaging 50 feet with the occasional lot being 100 feet wide. The high bank had a carriage road laid out along the ridge measuring 50 feet wide. 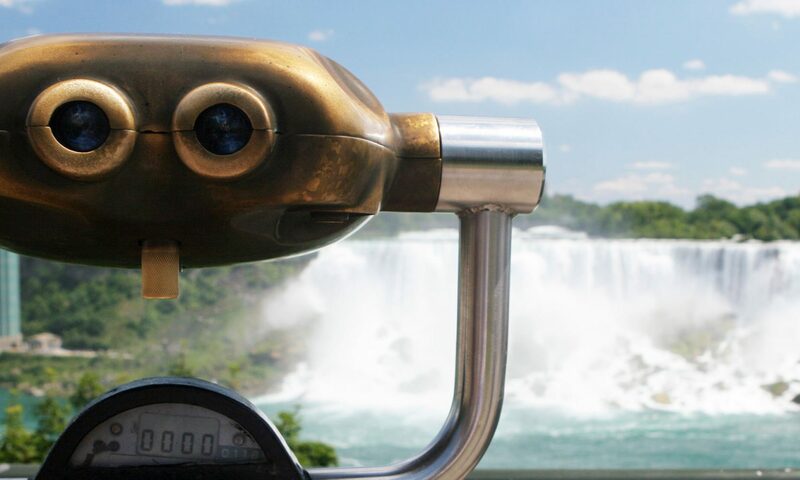 A space measuring 100 – 200 feet was set aside for gardening and walks, which offered one of the most sublime promenades in the world looking down upon the great Niagara Falls. Every person buying a lot would also be awarded one share in the City of the Falls Company. In addition, the City of Falls Company sold 2600 shares at $100 each. Stanley Street was 100 feet wide. All other streets were 80 feet wide. Stable Lanes were 20 feet wide. The plan of 1833, surveyed by E. Clements, was not registered, although another sub-division plan of the City of the Falls was registered at the Fonthill registry office in 1851. About half of the streets of the 1833 plan, the market square and the terraces were eliminated in the 1851 registered plan but the street names of the promoters remained. Cedar Island is called Long Island, although the registry office called it Swayze Island because it was once leased by Isaac Swayze. The original plan was to have a market square at the intersection of Murray Street and Allen Street. The City of the Falls plan boasted some of the widest streets in the city. The 1851 plan showed a tollgate at the corner of Portage Road and Dunn Street. The company paid full costs of local improvements. A water works system was installed using wooden pipes to transport the water. The water pressure proved to be too great for the wooden structures causing the pipes to burst apart. The company had built their own water works system included a pumping station at Table Rock (at the edge of the Horseshoe Falls). It would be capable of producing 80 gallons of water per minute. The station was operated by a water wheel with a hosepipe and a water dam. A water tower was built on the high ground at the top of the moraine. This tower was also used for a short time as an observation tower. Wooden pipes were laid to this water tower and from there to all the company houses and hotels including the new Bath House. Unfortunately, when the pumps were started to pump the water through the wooden water pipes, the pressure was too great for and as expected it caused them to burst. Many of the streets in the new survey were named after the charter members of the City of the Falls Company. Stanley Street was given its name by the City of the Falls promoters. There was no shareholder by that name but it was probably named in honour of the Honourable E.G. Stanley, then Colonial Secretary in the British Government. Other street names included Hay’s Mount, Royal Terrace, and Point Turnagain. In Stamford Township, Victoria Avenue was known as the 1st Concession, Stanley Street was the 2nd Concession, Drummond Road was the 3rd Concession and Dorchester Road was the 4th Concession. The original plans include schools, churches, libraries, ball & promenade rooms and public gardens. Three prominent hotels already stood within the boundaries of the new City of the Falls. The Pavilion House, which stood on the top of the moraine just south of the entrance to Oakes Drive (Fallsview Boulevard). The Pavilion House was the largest hotel in the area. The Ontario House, which was located on the west side of Portage Road just north of Loretto Academy. This became the headquarters for the City of the Falls Company. The Red House (Prospect Hotel), was located on Portage Road near Lundy’s Lane.